Blowout Sale! 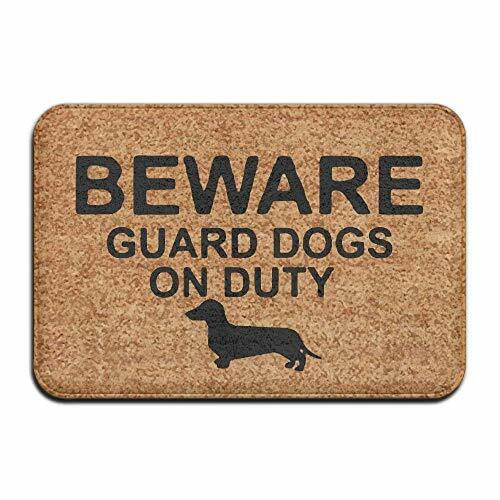 Save 63% on the MECIKR Doormat Guard Dachshund On Duty Entrance Floor Funny by MECIKR at Lawn and Garden Mart. MPN: 0804mats-1468. Hurry! Limited time offer. Offer valid only while supplies last. Are you tired of plain entrance door mats with dull, boring designs? Do you want to make your home or store front door more welcoming to your guests? Are you tired of plain entrance door mats with dull, boring designs? Do you want to make your home or store front door more welcoming to your guests? Are you in search of an original practical gift for the upcoming housewarming party? Well, maybe you can come to our store! MECIKR has just released the perfect door mat, to make any home or workplace front door more elegant, stylish and welcoming! Material: Suede (no hair), easy to care, the middle layer is absorbent sponge, the back is plastic non-slip bottom. Size: 23.7 x 15.7 Inch. Features: Water absorption and dehumidification, durable. Easy to clean: Sweep or wash it with your garden hose, to have it fresh, healthy and clean like brand new for many years to come! Suitable for a variety of occasions, such as bathroom, bedroom, bathroom, etc. If you have any questions about this product by MECIKR, contact us by completing and submitting the form below. If you are looking for a specif part number, please include it with your message.